IDF forces operate near Shechem in an attempt to locate terrorists who murdered Rabbi Raziel Shevach. IDF forces from the Shomron Regional Brigade conducted operations overnight Tuesday following the shooting attack near Havat Gilad, in which Rabbi Raziel Shevach was murdered by terrorists from a passing vehicle, who then fled the scene. The soldiers, who were assisted by special forces, blocked several villages in the Shechem (Nablus) area and conducted searches in an attempt to locate the terrorists. The investigation into the attack continues. “In light of an assessment of the situation, it was decided to reinforce the Judea and Samaria area with additional forces,” the IDF said in a statement. “The IDF will continue to operate day and night in order to protect the security of the residents of the area and residents of the State of Israel,” it added. Also on Tuesday night, a violent riot broke out during an arrest operation by the IDF force in the city of Jericho. During the riot, about 100 Palestinian Arabs threw rocks and burning tires at the soldiers. The troops responded by opening fire at key rioters. During searches in the city of Hevron, IDF forces, together with the Israel Security Agency (Shin Bet), seized thousands of shekels of terrorist money. The operation was part of an ongoing campaign against funds used for terrorism. The findings were transferred to the security forces. 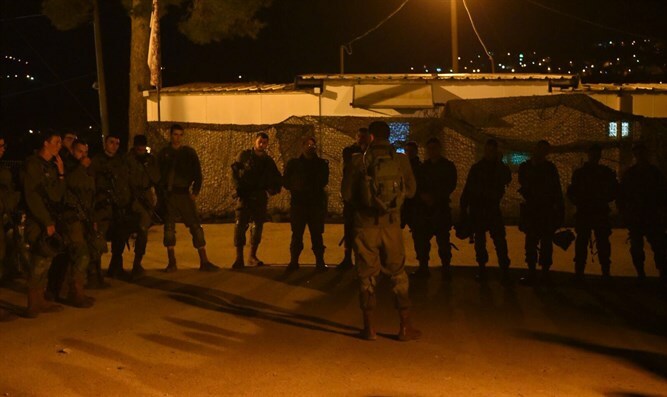 In addition, IDF forces detained 11 wanted terrorists in Judea and Samaria overnight Tuesday. They are suspected of involvement in terrorist activities and violent disturbances against civilians and security forces.